The Western New York winter is worth celebrating, and nowhere is it more spectacular than at the water’s edge. For 35 years, Rochester has been gathering at Ontario Beach Park to revel in winter’s extreme weather and celebrate the bonds built by the shared experience that makes Western New Yorkers a hardier bunch. All events will take place at the Port of Rochester Terminal and Ontario Beach Park, but a variety of Charlotte area merchants will also be offering specials and discounts all weekend. 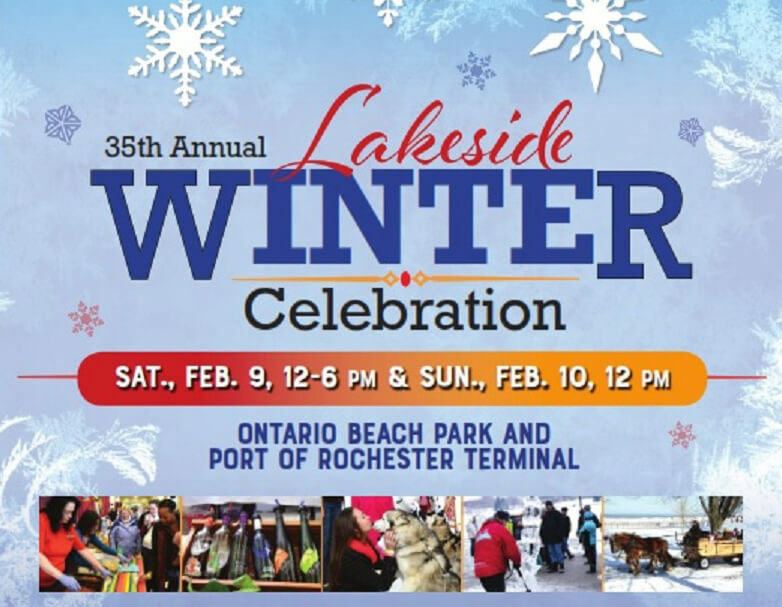 The first day of the Lakeside Winter Celebration is a flurry of activities for all ages. Early birds can take part in the snow-sculpture building contest, but you’ll have to arrive before 9 am if you want to try your hand at constructing a famous building – this year’s contest theme. Late arrivals and the less artistically inclined can marvel at the work of the ice sculptor. The 21-and-over crowd can enjoy local beverages at the Lake Ontario Wine and Craft Beer Festival, while everyone can warm up by tasting entries in the Chilly Chili Challenge. This culinary contest features well-known local restaurants, caterers and foodservice operators, as well as amateurs serving sample-sized portions of chili in pursuit of the title “Best Chili in Rochester.” Saturday evening will feature a fireworks show at 5:45 pm, which can be viewed from inside or outside the terminal building. For the second day of the Lakeside Winter Celebration, turn your attention to the water. Sunday’s highlights include Frostbite Sailboat Racing and the annual Polar Plunge to benefit Special Olympics New York. The big plunge takes place at noon. For Sunday’s activities, it will be wise to park at Greece Arcadia High School and take the shuttle to the Polar Plunge. Parking at the Port is limited, and more than 1,000 brave people are expected to take the plunge!